Day four and I've made it to the European continent today. I pulled out some of my aEngland polish which I have not wore for years. These polishes were so popular then they first come out, but I don't think I've bought any new ones for ages. What I love is that they have a soft holo sheen, but they are generally one coaters. 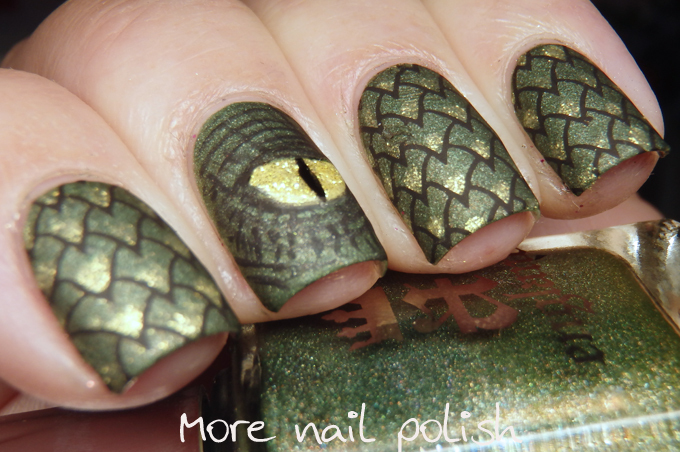 The two aEngland polished I used were Dragon and And the moonbeams. 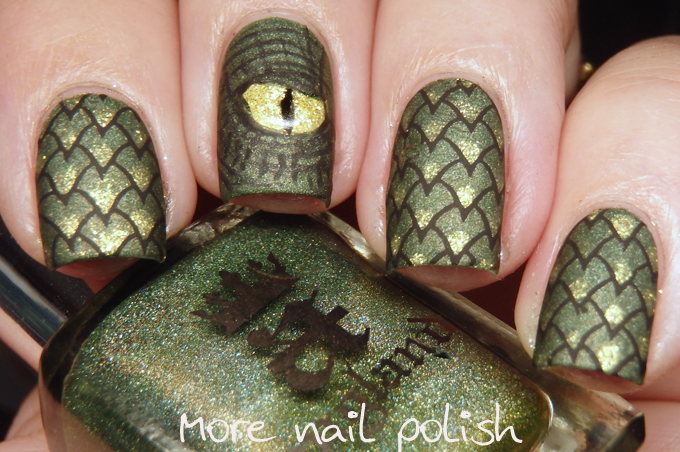 I was inspired by the name of the polish, and by the fact that Game of Thrones returns on Monday at 11.00am (which is the same time as the USA). I free hand painted the dragon eye. I figured it was about time I did something freehand for the Digital Dozen this month. 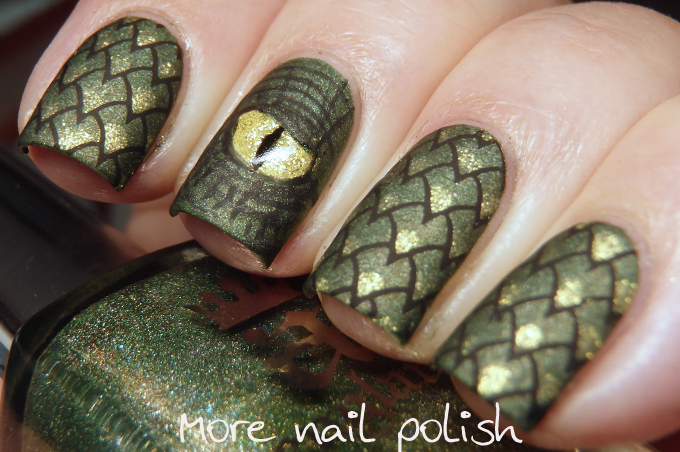 The stamping plate I used is the dragon plate from Messy Mansion for the scales. 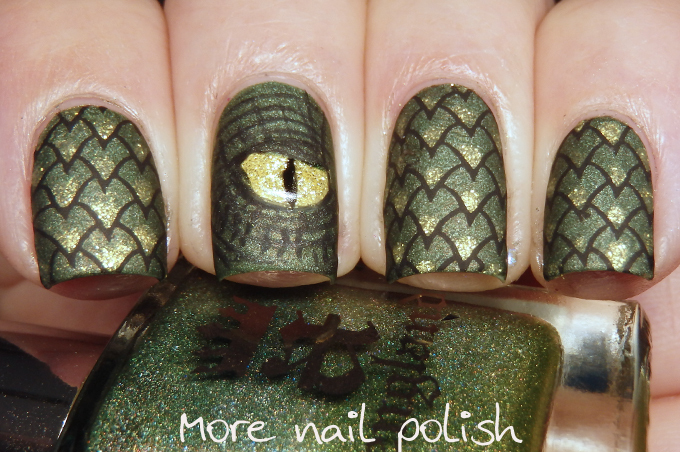 I applied OPI matte top coat to the entire mani cause dragons aren't shiny to me, although this did dull the holo effect. I added a bit of regular top coat onto the eye again to make it glossy, and it also really made it pop! The best dragon/reptile I've ever seen! I can't wait for GoT to start!!! :) This mani totally got me into the mood to watch Season 6 (again). Ohhh, that base polish is so pretty! !